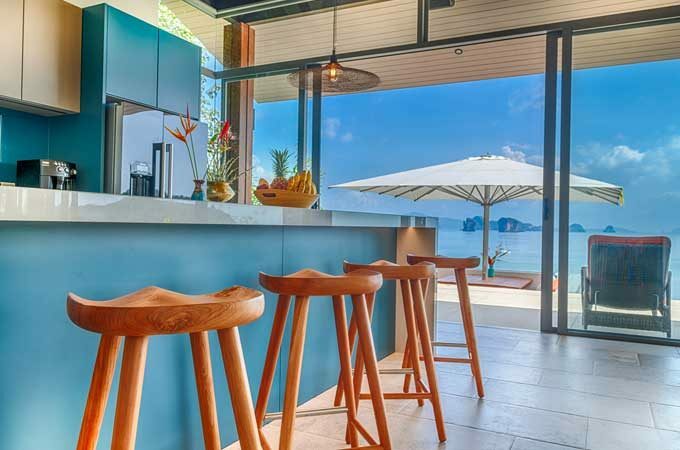 Welcome to Villa Eagle’s Nest, a newly luxury villa set in in the island of Koh Yao Noi, overlooking the stunning Phang Nga Bay. The seascape of unique limestone islands is incomparable and considered by many to be one of the best views in Asia. 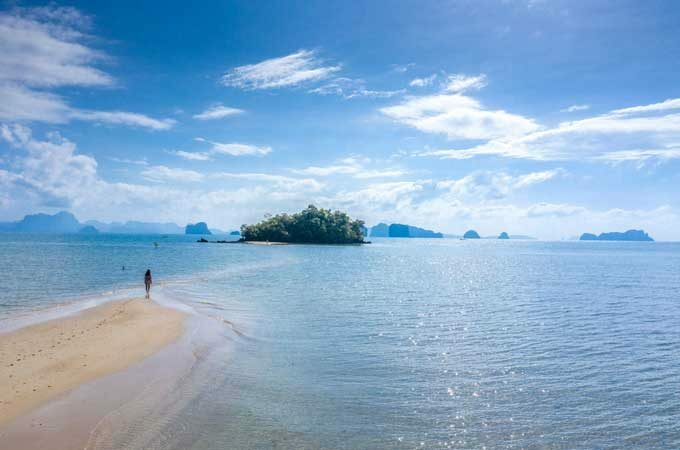 Only 20 minutes from Phuket by speedboat, the island paradise of Koh Yao Noi may just be Thailand’s best kept secret. 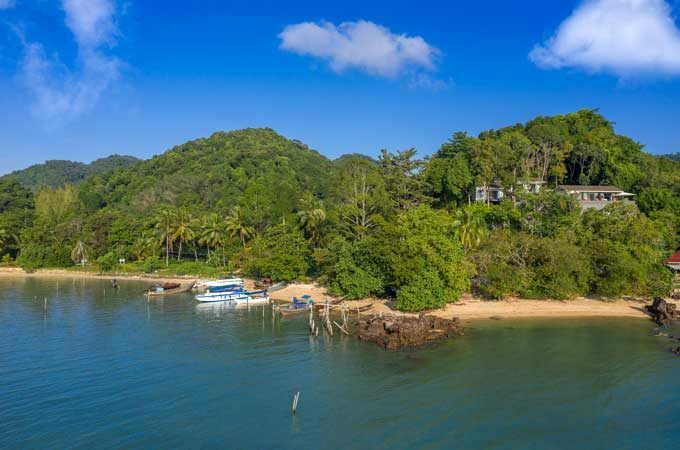 It is located within the magnificent Marine National Park of Phang Nga Bay which possesses over 40 islands and is home protected wildlife. 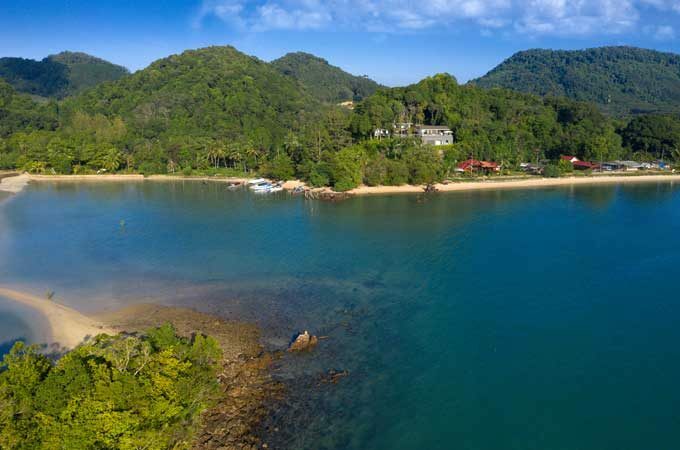 This tropical island is accessible only by boat or helicopter and thus remains largely undeveloped, natural and peaceful. 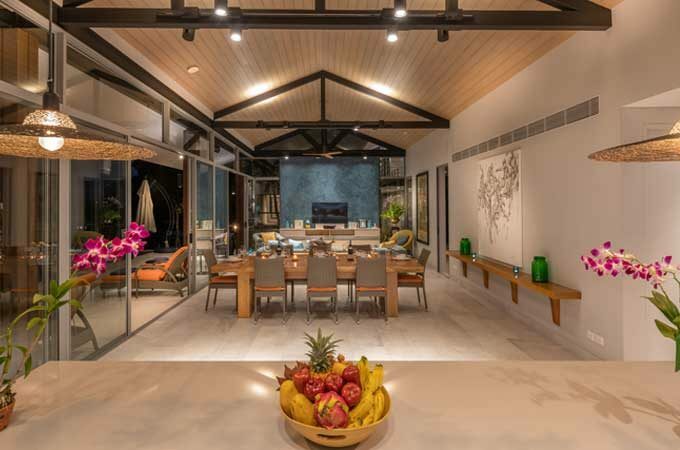 Completed in 2018, Villa Eagle’s Nest is unique for its quality and outlook. 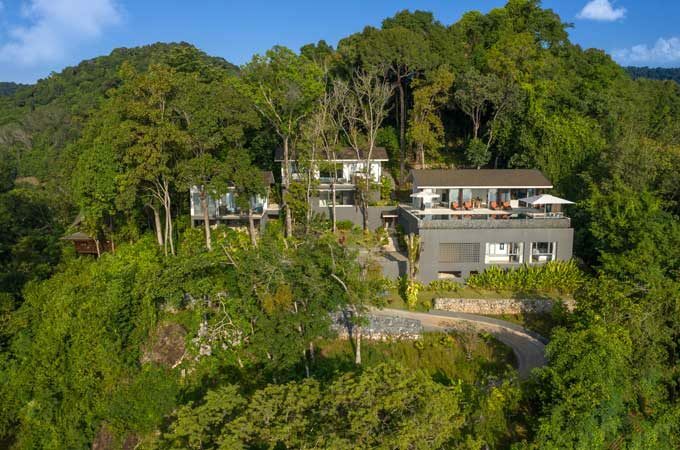 The sweeping panoramas from the property are simply breathtaking and can be seen from every room in this expansive estate nestled among the tree-tops. A skilled and personal staffing team ensures that every whim is catered for. The rental offering includes an open-air seated van and driver. 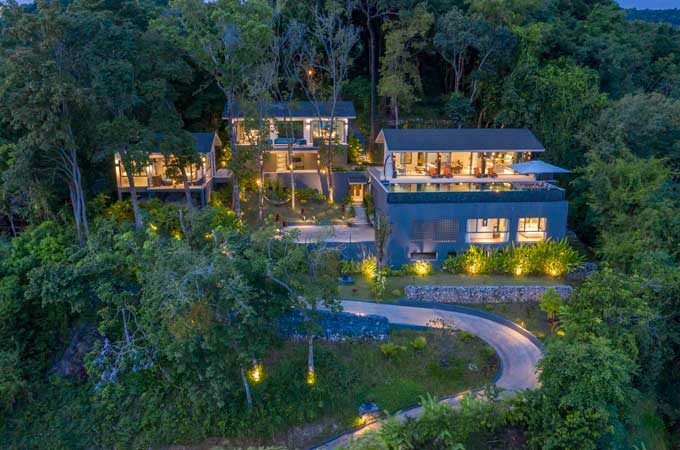 This is more than a home away from home, this is a serviced luxury villa on a remote and idyllic tropical island with every detail thought out. 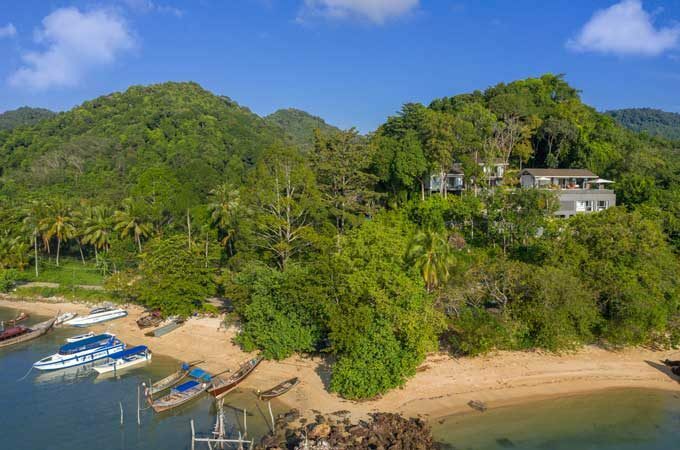 The grounds of this luxury villa cover a half-hectare and stretches from the hilltop to the beach below, with direct water and beach access. 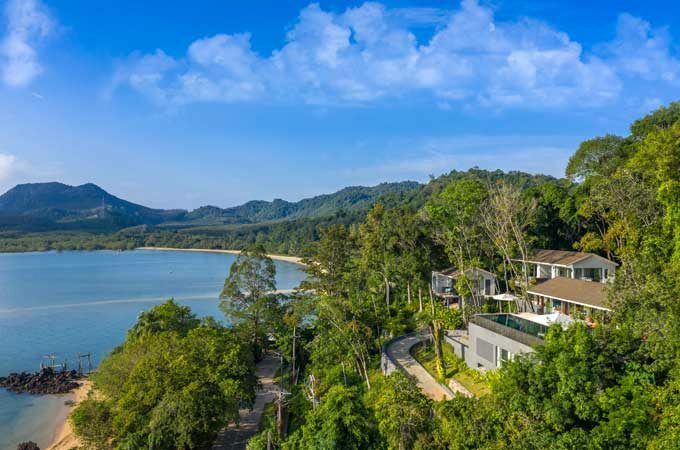 Eagle’s Nest is comprised of three connected main buildings all with spectacular views over the Marine National Park of Phang Nga Bay. 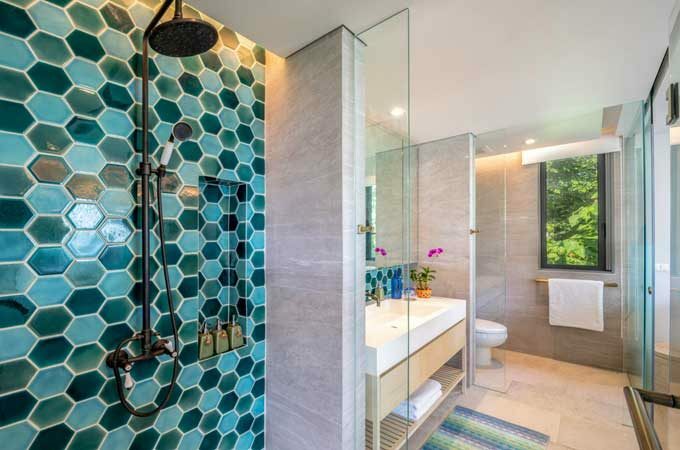 The four ensuite bedrooms make it perfect for families or small groups, and the villa can comfortably accommodate a diverse group without ever feeling crowded. 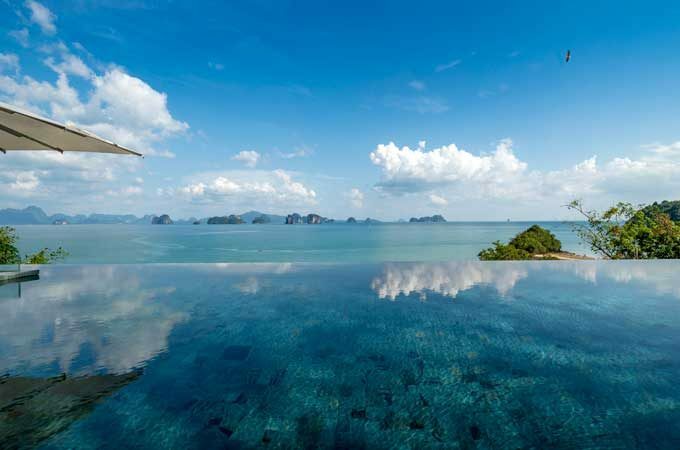 The 15m long infinity pool sets the stage for the stunning backdrop of Phang Nga Bay. Relaxing here is almost mandatory and guests can enjoy one of the sunbeds or the comfortable sofas in the sunken sala. For those up early, the sun rises directly over the water reflecting and casting beautiful hues of gold to frame each morning. 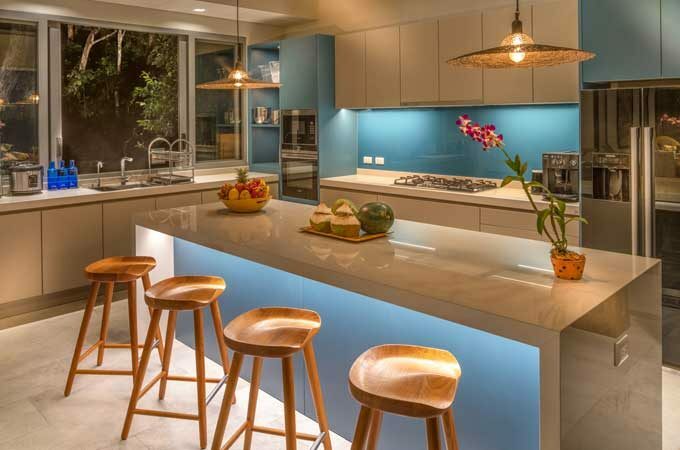 A modern kitchen and dining room allow meals to be prepared in-house as desired, and the dedicated villa staff will ensure the villa is always stocked with your favourite cold drinks and foodstuffs. 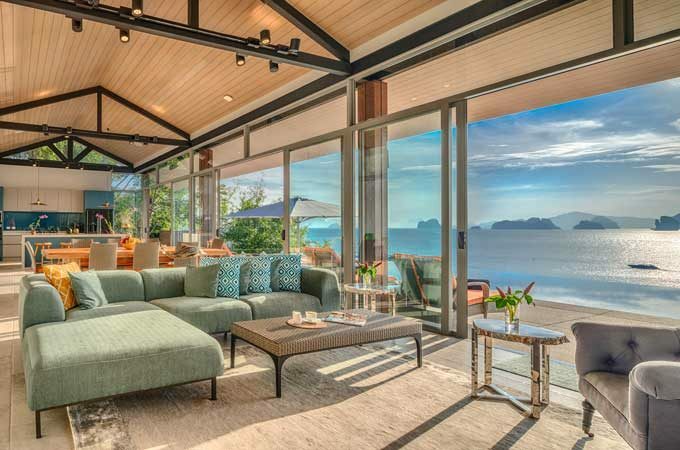 The 44 limestone islands of the Phang Nga archipelago create the stunning backdrop to Eagle’s Nest luxury villa. 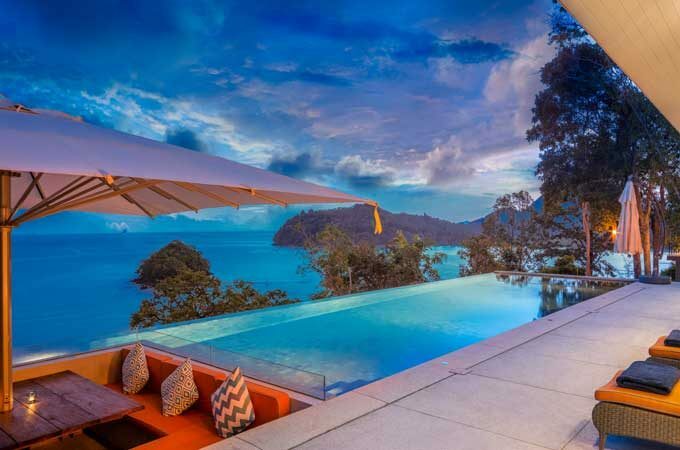 The world-renowned Six Senses Yao Noi resort is adjacent and shares the very same outlook. 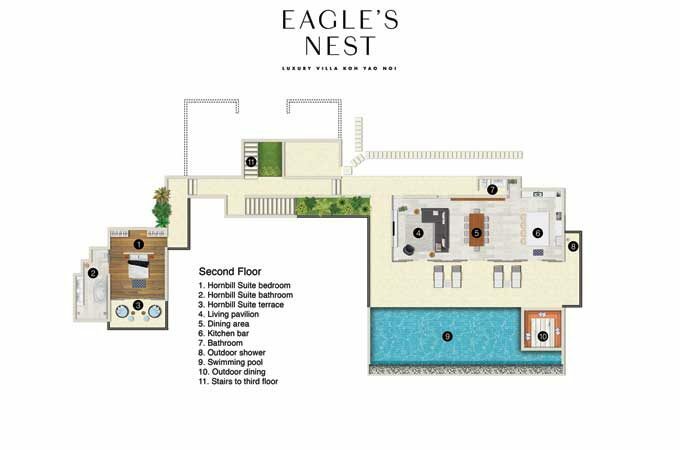 Eagle’s Nest believes in delivering hotel-quality service within a boutique villa environment. 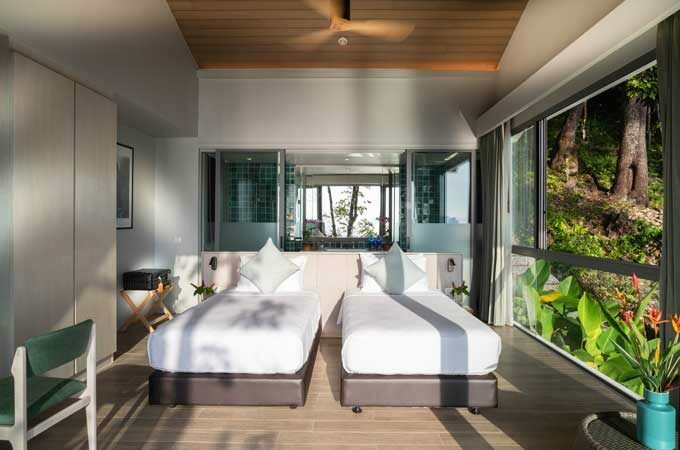 The dedicated husband and wife staffing team – Yon and Nuna – reside on site and will do their utmost to please with their warm and friendly Thai hospitality. They provide delicious cooking, housekeeping, and complimentary personal chauffeur services. Additional day staff service the pool, tend to the tropical gardens and assist the core team when the villa is busy, ensuring that service levels are always kept high. All food is prepared and cooked from local ingredients and if you have never tried Thai food skillfully cooked from fresh Thai ingredients, you will be in for a treat. Just caught seafood is always a popular choice, sourced locally from the fishermen in the village that day so you can be assured it will be delicious. 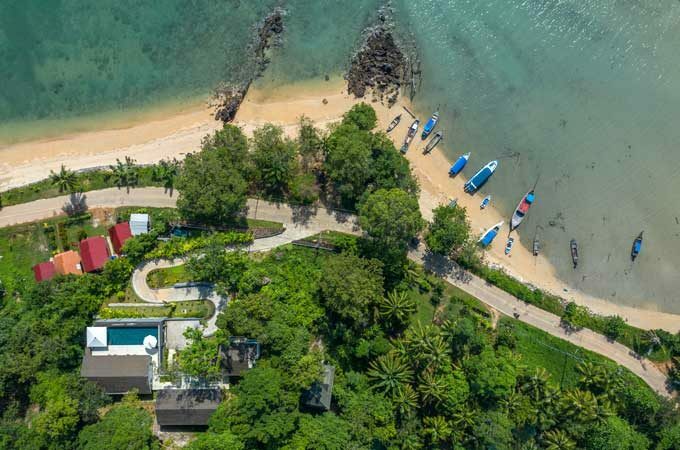 There is also a guest relations officer, Ms. Ann, who has over a decade of experience working for luxury resorts on the island – she is there to check in guests and provide concierge service such as organising activities and day trips for guests while assisting with any other issues that guests may have. 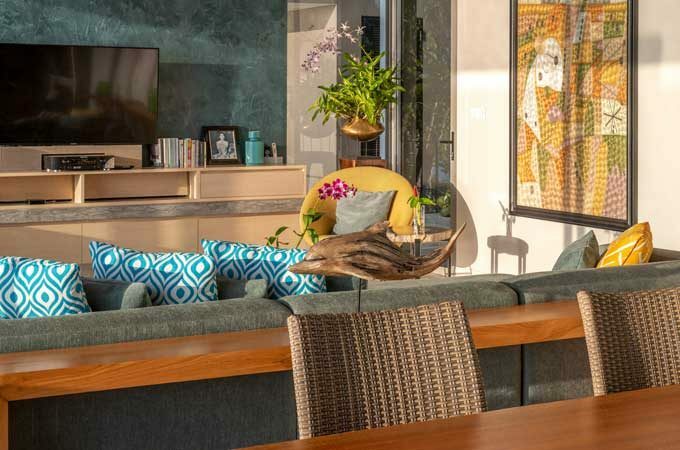 Each of the four master suites have been named after birds which are found in the area: Hornbill, Kingfisher, Sea Eagle & Hummingbird. 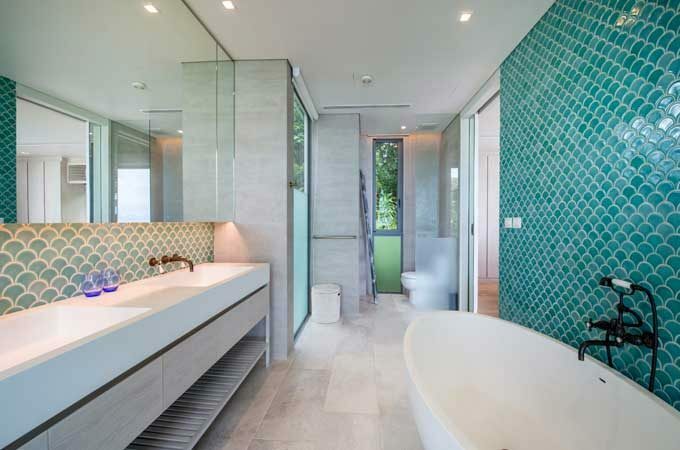 Each of the rooms feature ensuite bathrooms with either bathtub and rainfall showers. Three of the rooms contain a Kingsize bed, while the fourth has singles which can be joined if preferred. 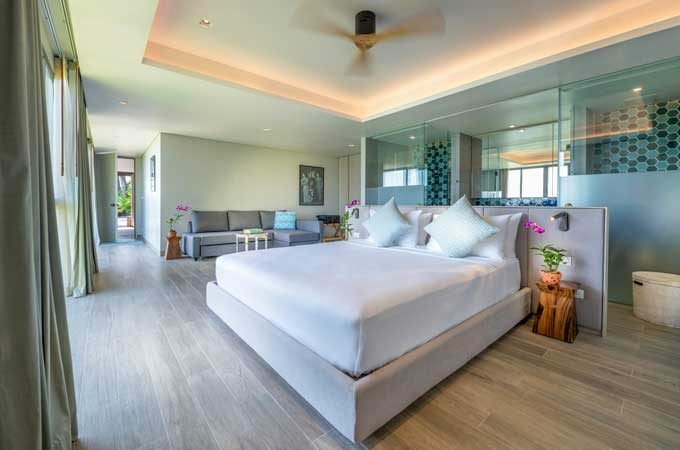 The elegantly restrained designs in each bedroom make use of the natural light and each one shares the same magnificent ocean views. 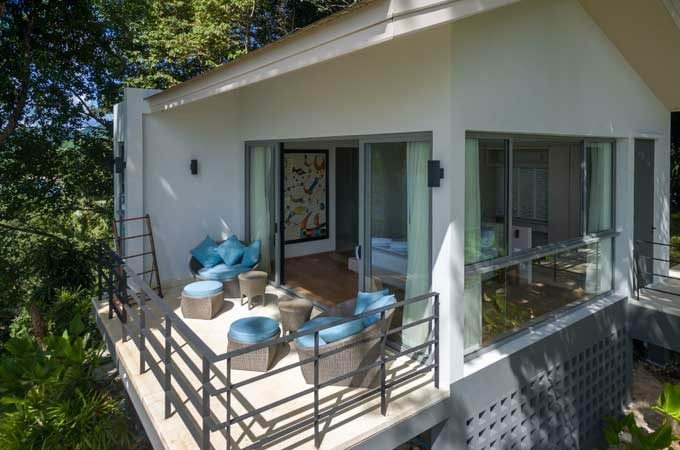 The Hornbill Suite opens onto its own private terrace with magnificent vista overlooking the ocean. This is the perfect spot to enjoy a morning coffee as you breathe in the fresh ocean air and ponder the possibilities of the day ahead. 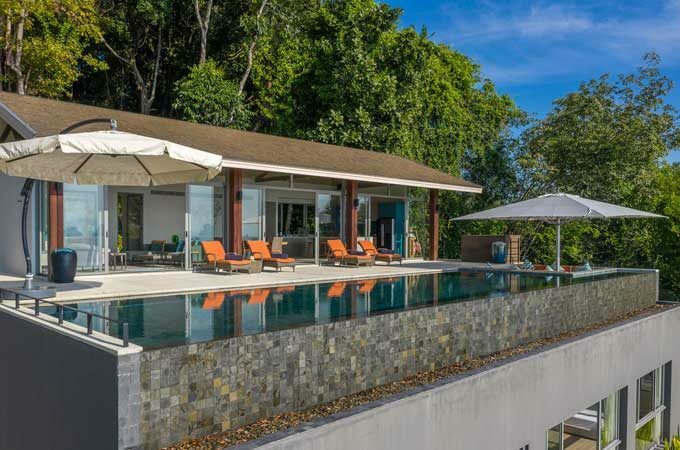 It’s not just the ocean which offers exceptional beauty as on either side and behind the villa is natural vegetation. 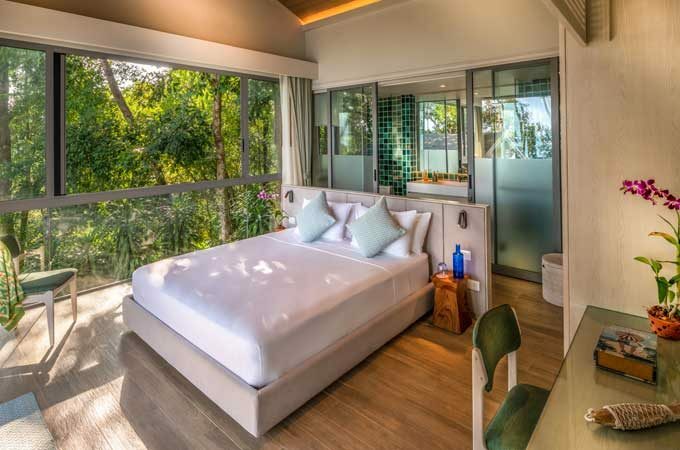 From your bedroom high in the treetops you will be sharing the view with the giant hornbills who make their home on this island. The spacious Kingfisher Suite contains a fold-out sofa bed which can accommodate 2 children, or 1 adult as needed. 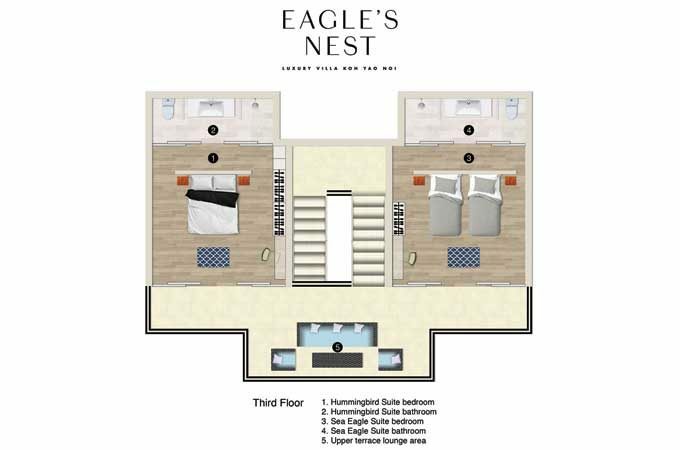 Whether you are a family with children or a group of couples or singles, the sleeping arrangements at Eagle’s Nest can be configured to suit your needs but the villa is firm about the maximum number of people and children who can sleep in the villa as that will affect the service experience for all. The large open-plan main building is the center-point of the villa and is perfect for entertaining. Dependant both on the weather and your mood, the villa has provisions for dining alfresco or indoors. 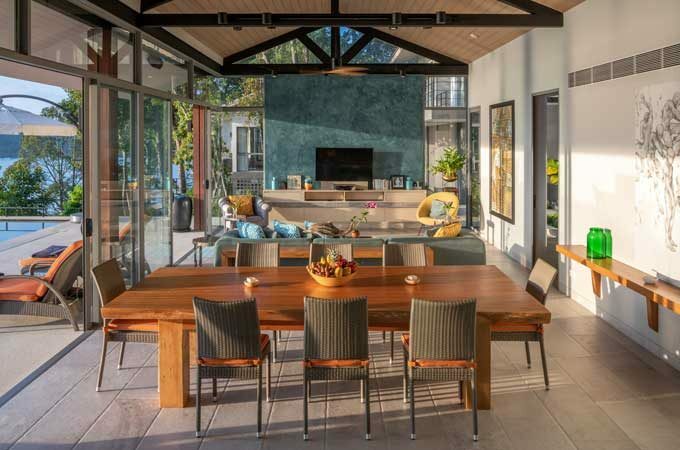 The dining area has large sliding doors which open onto the pool area and can be left open for the fresh ocean breeze or closed up and air-conditioned. Here you will find a large dining table which can seat up to 10 for meals. 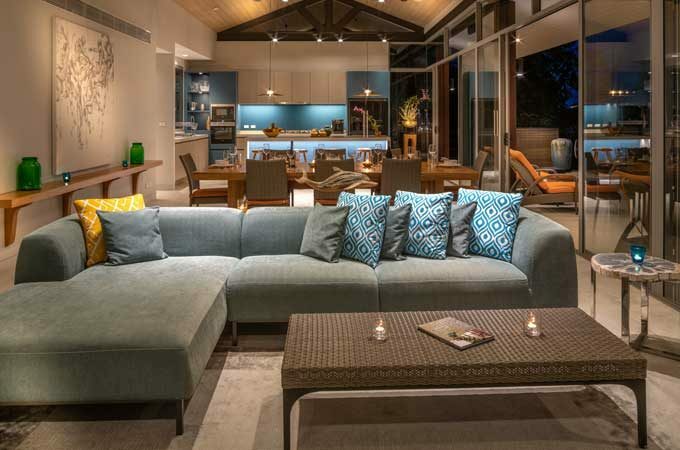 Beside the dining space is a large sofa and lounge space complete with flat-screen tv and stereo. 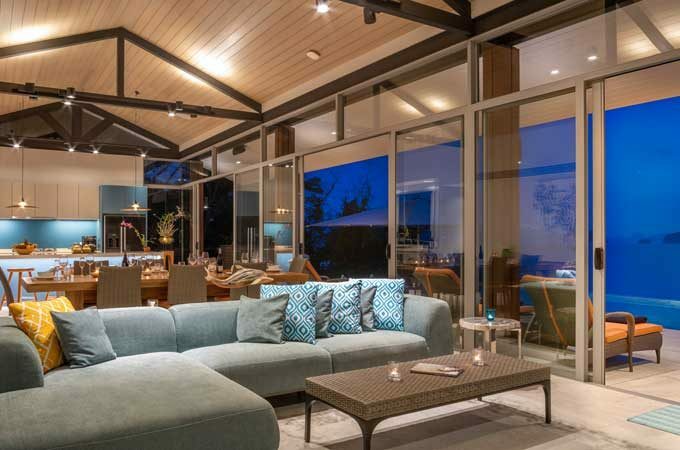 With the doors open and a cool ocean breeze, it’s a great spot to wind down the evening. 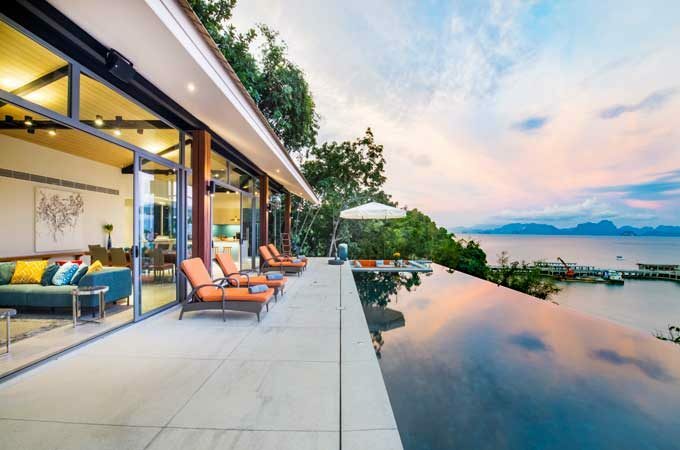 Most guests enjoy spending their time either in the large pool or on the deck surrounding it. The sunken sala at one end, has a large shade umbrella and dining table, and is the perfect environment for watching the world go by. 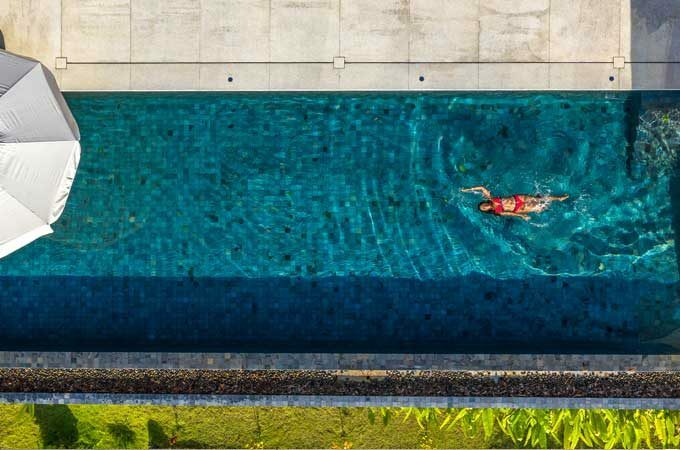 The long infinity pool stretches the length of the main building and seems to float in midair, as the ocean and the horizon blend perfectly with the different shades of blue. 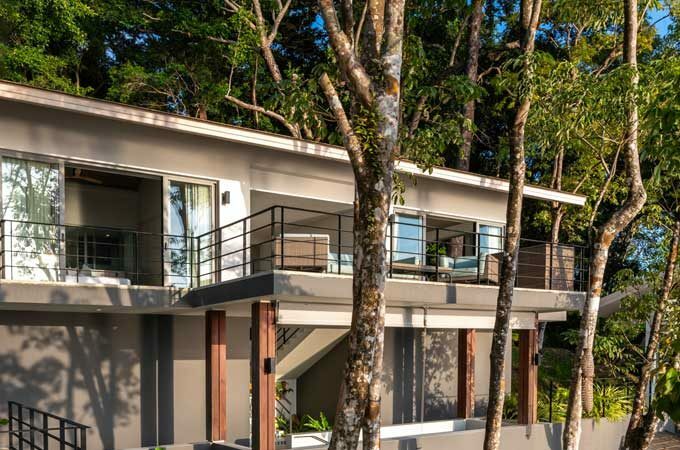 Surrounded by the villa and in sync with the natural contouring of the land – it provides the perfect level of privacy and seclusion while maintaining unobstructed views of Phang Nga Bay, so you will always be swimming with the ultimate Instagram view as the backdrop. 5 wooden sunbeds are part of the villa’s facilities for those who wish to enjoy the sun and spend part of their vacation improving their tan. If you like running or cycling, then the coastal road in front of the villa is both quiet and picturesque, or for something more challenging head inland over the hills towards the West of the island. There is little traffic on the island and you will be sure to be treated to sightings of buffaloes, lizards and birds along the road. 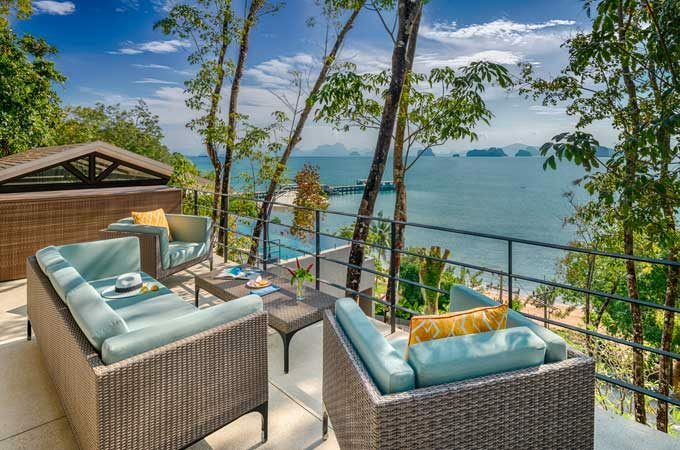 The Eagle’s Nest luxury villa is the perfect place to take a family vacation. 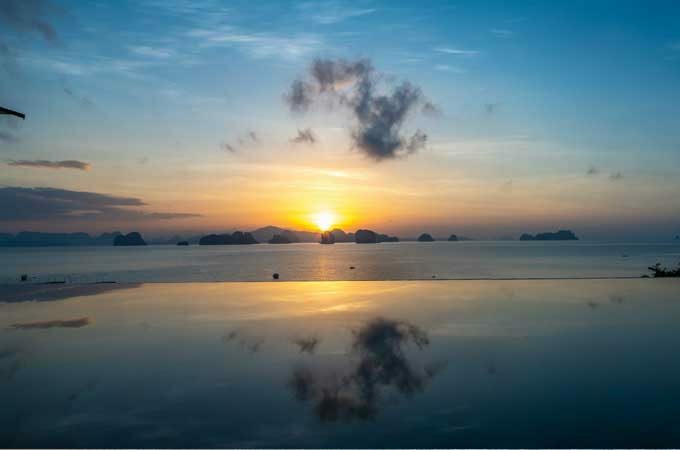 For those who love fresh air and the outdoors, then Koh Yao Noi is the perfect choice. As most of the island is a national park and undeveloped, there is ample space to roam and enjoy the natural environment. The locals are warm and friendly, and the island feels a lot more like the Thailand of days gone by. You won’t find raucous bars and all-night beach parties on this island. If you ever tire of the ocean views, the island provides ample opportunity for recreational activities. 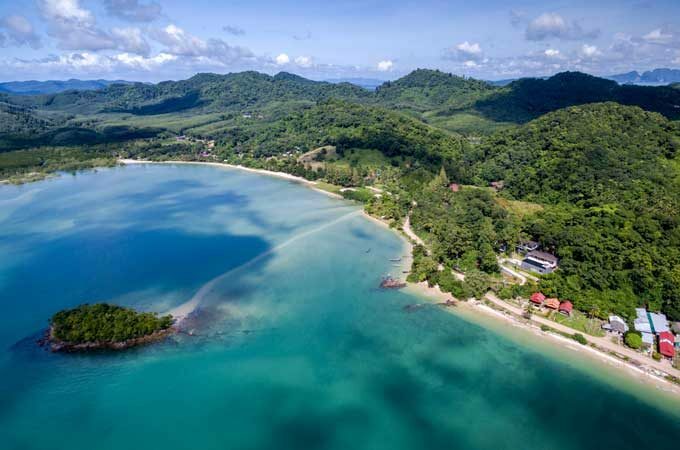 Kayaking, cycling, snorkelling and fishing adventures can all be organized by the staff at the villa. 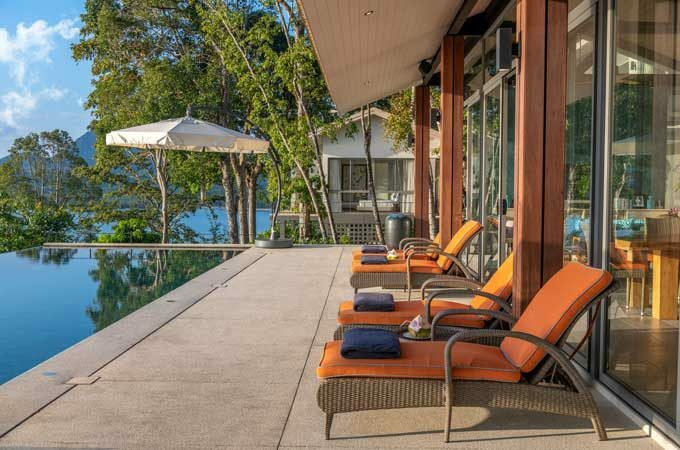 A popular yoga retreat is just a short walk away, and private lessons can be arranged at the villa. For the more passive, Wi-Fi, satellite television and stereo will help to keep them entertained. 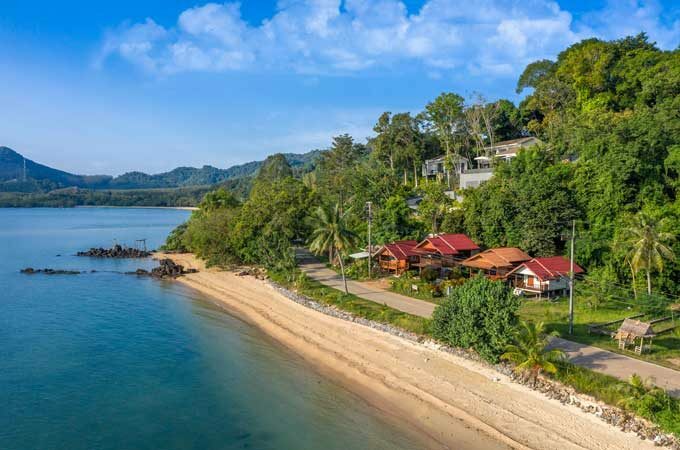 Venturing out on the island, Koh Yao Noi is a family-friendly destination and you will never run out of things to do or see. There are limitless opportunities for fun and adventure, and the helpful villa staff can organize excursions on and around the island. Nearby Hong Island is a short boat ride or kayak-paddle away and its inner secret lagoon is unrivalled in beauty. Meanwhile, rock climbers make their journey from the far reaches of the world to enjoy scaling the unique limestone karsts that dot the bay. The clear, turquoise waters provide endless opportunities for snorkelling or diving or simply exploring. 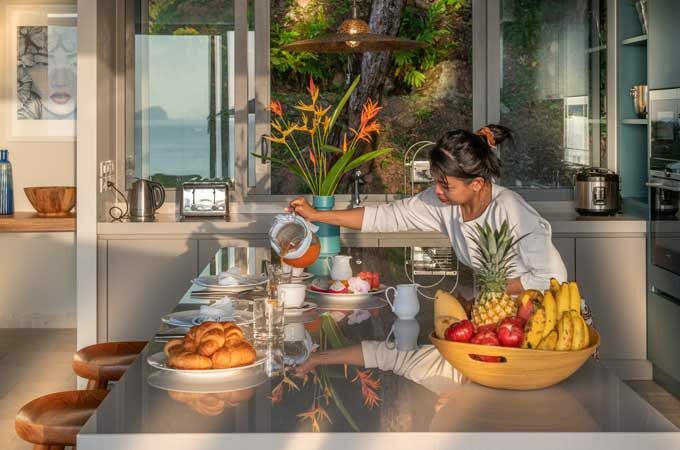 If you want to learn a new skill while on holiday, then local Thai cooking classes are available and can be held in the villa or at Mina’s charming wooden home by the rice paddies. 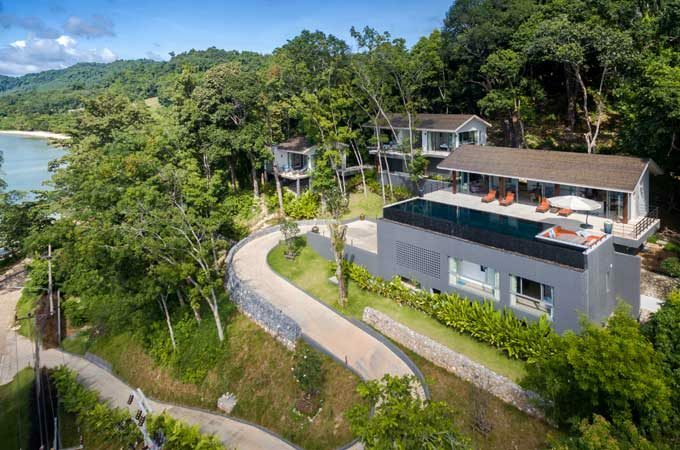 Eagle’s Nest is conveniently located in an elevated position on a small hill beside the local fishing village of Thakao. 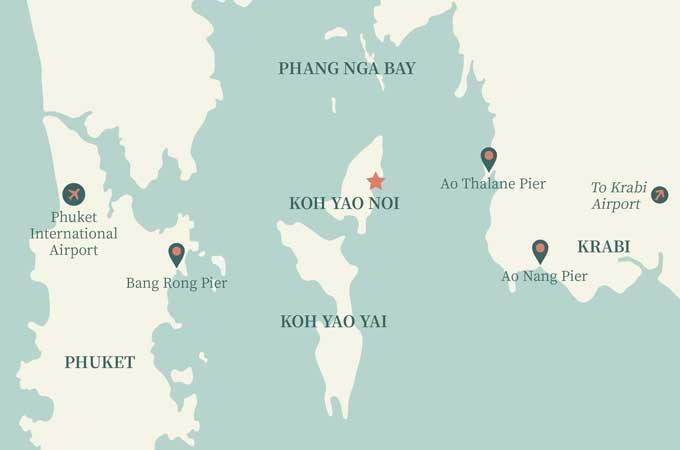 From here you can take boat tours to Krabi or nearby islands, or sample some of the local foods. A short drive away from the villa you will find many of the island’s best restaurants. 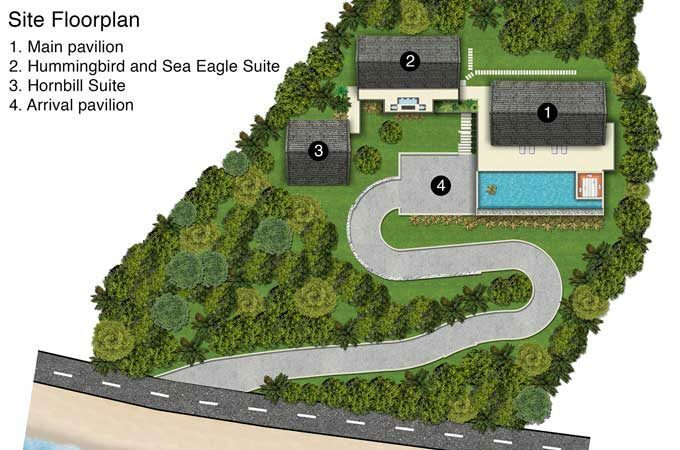 In fact, most amenities on the island are just a short distance away. The pier with speedboat connections to Phuket is approximately a 15-minute drive. 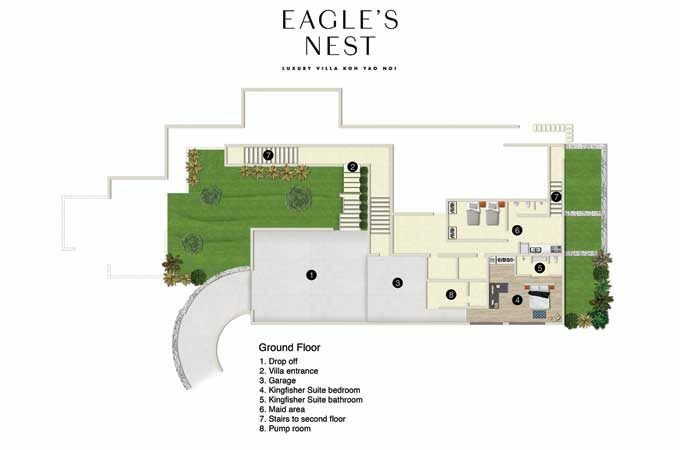 The perfect ultra-luxe island escape, Eagle’s Nest is an unparalleled for the sole purpose of making lasting memories.